Coming at you with another off-the-shoulder top today. I'm pretty sure that I'll still be sporting off-the-shoulder looks when I'm seventy, because I can't see myself ever growing tired of the style. This VaVa by Joy Han top is from last year, and still one of my favorites (I've linked this years version below). 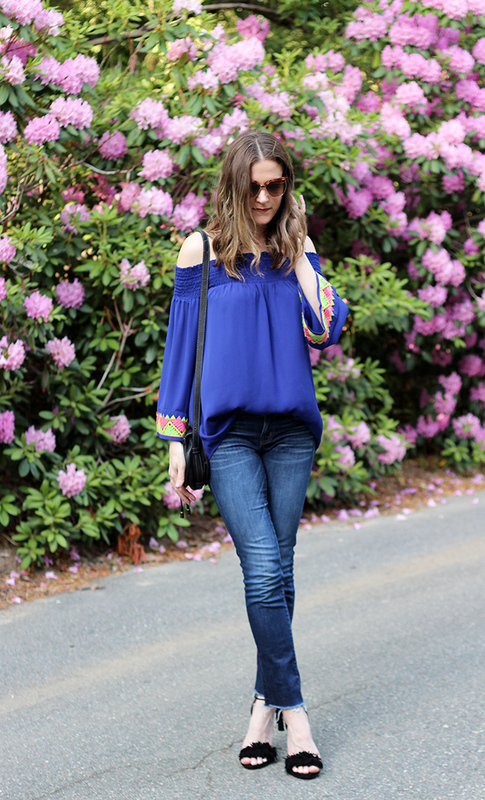 I love the mix of colors, and embroidered details on the bell sleeves. 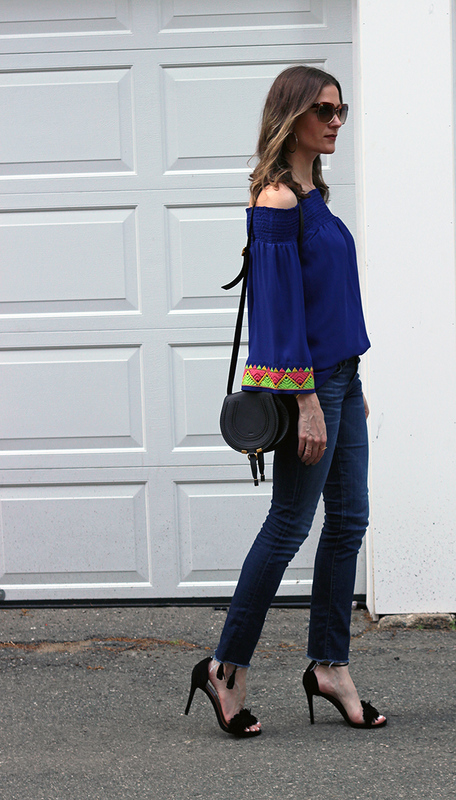 Paired with my frayed hem jeans, fringe heels, and hoop earrings and I felt somewhat ready for a fiesta! All I'm missing is some guacamole and a margarita. Come to think about it, that's not a bad idea for tonight, after all, it is the weekend! PS. These Steve Madden Sassy heels are available at 6pm.com for under $100! You're welcome. The feature blogger of the week is Hilary from Embellishmints. I'm loving the pop of color she added to her navy dress. Make sure to check out her blog where she not only shares fashion, but great recipes! Rachel, gorgeous top! I love the embroidered details and this color is superb! What a great top Rachel! The embroidery details adds great texture. Great look! 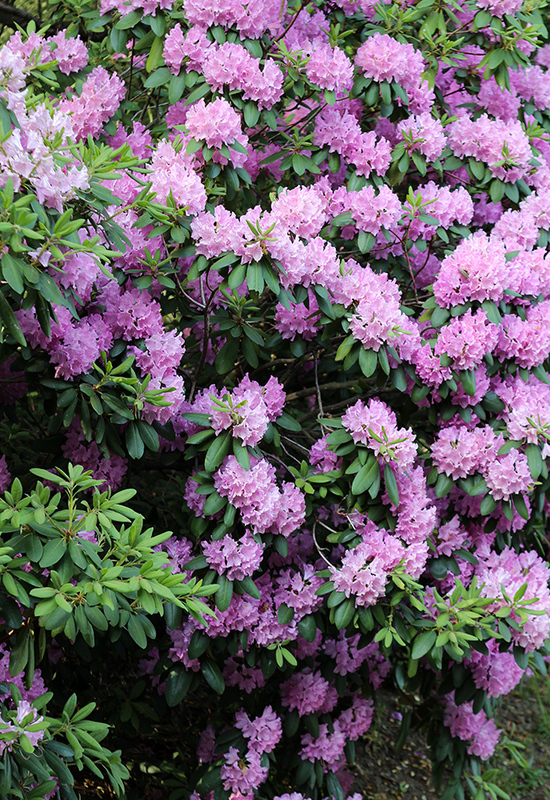 And what a gorgious background! Super cute look and yes you need to be holding a margarita to complete this look. ;) Love the denim you are wearing, too! I really need to get some more off the shoulder tops, the one I have is just not enough! Great outfit! I really love the detail on the sleeves! Super cute! That top is so cute! Love the embroidery detail! It's perfect with your frayed denim! Obsessed with that top! The embroidered sleeves are perfection! Wishing you an amazing weekend babe! OMG, I LOVE this top Rachael!! The detail on the sleeves is to die for! Gorgeous look! What a great top and the color is so nice and vibrant. You know a top is worth every penny when you wear it year after year. Fabulous. Enjoy margaritas, that's what we are making tonight too. Thank you so much! Enjoy your margaritas and have a wonderful weekend! loving that outfit! that shirt is so vibrant and a great color choice for you - also your shoes are amazing! enjoy margaritas! Gorgeous outfit! Love the top and shoes! Oooh such a fun top!! Such a great look! I absolutely love that top! Lovely top and thanks for the pointers on the heels sale. Beautiful top! I love the details on the sleeves! The sleeves add a really nice touch of color to the outfit without being overwhelming! The embellished cuffs of your top are really eye-catching!! 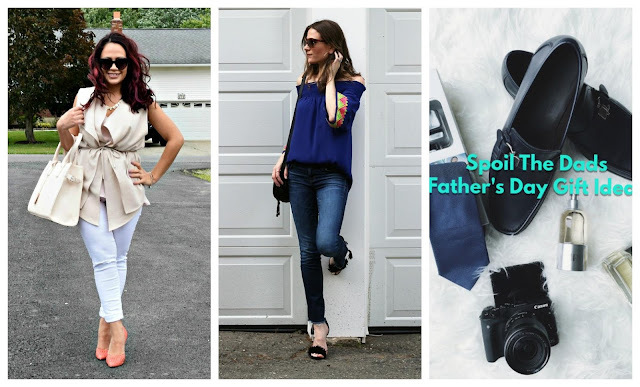 Thank you for linking up on Fancy Friday. My pleasure, thank you for hosting! Amazing photography, you are looking so elegant dear! Thank you so much Dedra! Wow, this outfit is gorgeous, I love your shoes! 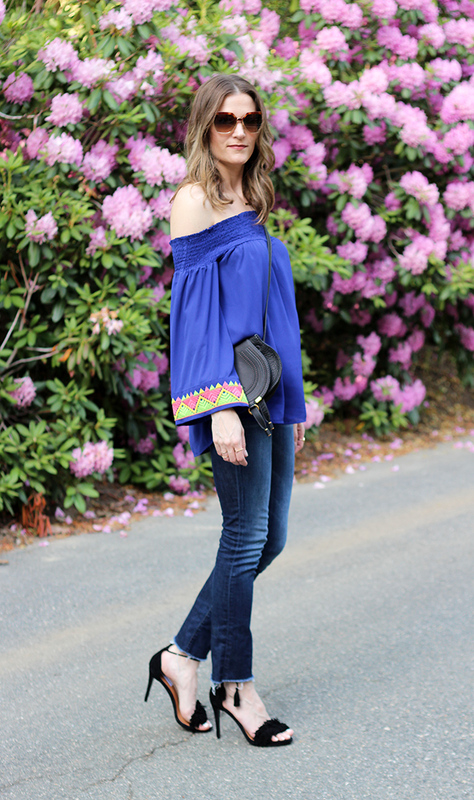 Love the colorful sleeve detailing and thanks for hosting the linkup! Loving the detail on your sleeves! I love that top! So cute! And with your shoes, it's perfection. Loving those heels! I'm starting to get addicted to off the shoulder tops :-) Yours is super cute!